Bones: There are bones in the fillets but they are easily removed. 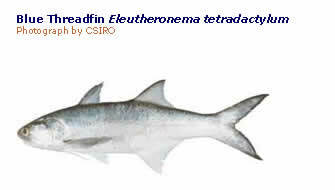 Price: Threadfin salmons are medium- to high-priced finfish. King threadfin fetches a high price, blue threadfin a medium price. Recovery Rate Fillets: 70% from headless blue threadfin (gilled and gutted), King threadfin often have large bony growths along the backbone, which make them difficult to fillet. They are therefore often sold as cutlets for maximum recovery.